The Academy Awards is a time for people to get together and talk about movies. Your little ones have a chance to see their idols dressed up while you mock – ahem compliment – the outfits. Around the country people get together for parties. People try to guess winners. Winner bingo is created, and prizes given. There may even be a dress up factor at your house. But nothing makes a party a party like food! Tapas, smaller dishes made for sharing, are great for such an event. People can snack while watching Bay Area-native James Franco – grew up in Palo Alto – and the “Princess Diaries” star Anne Hathaway host one of Hollywood’s most prestigious nights. Will it be “Toy Story 3” or “Inception” that will take home the little gold man for Best Picture? Watching could be a great time to chat about dreams. Local boy Franco, for example, is not only one of the youngest hosts but is also nominated for Actor in a Leading Role. Last year’s Best Director, Kathryn Bigelow who also won Best Picture for “The Hurt Locker,” grew up in San Carlos. Both got their start here, dreaming about movies. Get the conversation started with some tasty food and pomegranate lemonade using these recipes from Health.com. 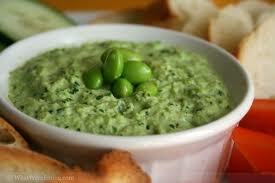 You may want to get some pita chips to go along with the garlic and edamame dip. Enjoy! For Tapas Spread: Arrange all tapas ingredients on a large platter. For Salad: Whisk together vinegar, honey, and mustard in a small bowl. For Shrimp: Toss the shrimp with 3/4 teaspoon salt; set aside for 10 minutes. Warm the olive oil in a large pan, and gently sauté garlic over medium-low heat for 3 minutes or until fragrant and beginning to color. Add shrimp, remaining 3/4 teaspoon salt, crushed red pepper, and smoked paprika; cook over medium heat, turning the shrimp occasionally, for about 3 minutes or until just cooked through. Remove shrimp from pan with a slotted spoon. Add sherry to pan, raise heat to high, and reduce liquid (about 2–3 minutes). Add lemon juice, return shrimp to pan, and toss gently; sprinkle with parsley. Serve immediately. Cut about 1/4 inch off the top of the garlic head, so the cloves are slightly exposed, but don’t peel the garlic. Wrap the head loosely in foil, and place in a preheated 400 degrees oven for 45 minutes or until garlic is very soft and golden. Let cool; then squeeze the garlic cloves out of the paper-like peel. Meanwhile, bring 2 cups water to a boil; add edamame, and boil 5 minutes. Drain. Combine edamame, garlic, cumin, and next 5 ingredients (through 3 tablespoons water) in a food processor, and pulse until smooth. Garnish mixture with the chopped cilantro and serve. Pour lemon mixture and pomegranate juice into a pitcher, and stir well. Add 2 1/2 cups water. Pour into 4 (8-ounce) glasses. Add crushed ice as needed to each glass.